We’re halfway there! Ahhh! I love everything everyone has created so far. It’s been such a rewarding experience organizing this? We should do this again sometime. 2017. Pentalic Illustrator’s Sketchbook paper; Prismacolor Col-Erase pencil; Adobe Photoshop CS6; Wacom Cintiq 22HD; Originals are 1898 x 1769 px and 1570 x 1697 px. To Holtz’ frustration, however, Erin was warned by Abby about her gift-sleuthing. Holtz also finds that her girlfriend is an incredibly patient and secretive woman. “Building a box,” Erin answers without looking up. She’s stolen Holtz’ soldering iron and several scraps of metal and is constructing a crude looking cube. Holtz doesn’t mind, she’s stolen enough of Erin’s toothpaste to make up for it. Holtz is being a real dude, apparently. She can’t find the box. It’s the day before her birthday and she can’t find the box. She’s been looking all week and she can’t find it. She’s frantically searched the entire firehouse up and down. Thrice. She slams the door to the cabinet with more force than is strictly necessary. Still nothing. “Maybe if you cleaned your mess once in a while, you might find what you’re looking for,” quips Erin from the couch behind her. She’s leisurely reading a scientific journal and being patently smug. Then something in her brain clicks and Holtz is off like a shot to the kitchen. Of course! It’s the only place she hasn’t looked: the pile of dirty dishes she had been avoiding doing all week. She pushes aside the top layer of grimy pots, and there, buried under plates and cutlery, is the metal box. “Oh haha Erin, you’ve made your point,” Holtz calls and she pulls it out. She grabs a butter knife and wrenches it open. Inside the box is nothing, save for a tiny fish-shaped piece of red paper. Holtz turns to find Erin, arms crossed and leaning casually on the frame of the kitchen door. She’s smiling like the cat that ate the canary. Holtz knows when she’s beaten, but she doesn’t really mind when it’s Erin doing the beating. Abby’s present is a promissory night out on the town that is fulfilled the night before her birthday. At 6pm, Patty and Kevin are dragged along to Holtz’ favourite karaoke bar. Erin has to stay back to work, but promises to join them after she finishes up an article she needs to submit by tonight. “Maybe, ‘though you never know with her,” Abby smiles like she has a juicy secret. Holtz is one too many drinks in to unpack that. Suddenly, Holtz can feel her phone buzzing in her pocket as Kevin’s fantastic rendition of Britney Spears’ “Toxic” makes it too loud to hear her phone. She looks down at the name and laughs. As if summoned, Erin is calling her. “Hey babe, what’s up?” She half yells. Holtz bolts out of the bar without a second thought. She makes it back to the firehouse in record time. She actually has no idea how she did it. “Is everything okay? What… Broke…” Holtz trails off as she reaches the top of the stairs and she sees what has become of her lab. “Happy Birthday,” Erin sings as she seemingly appears from out of thin air. 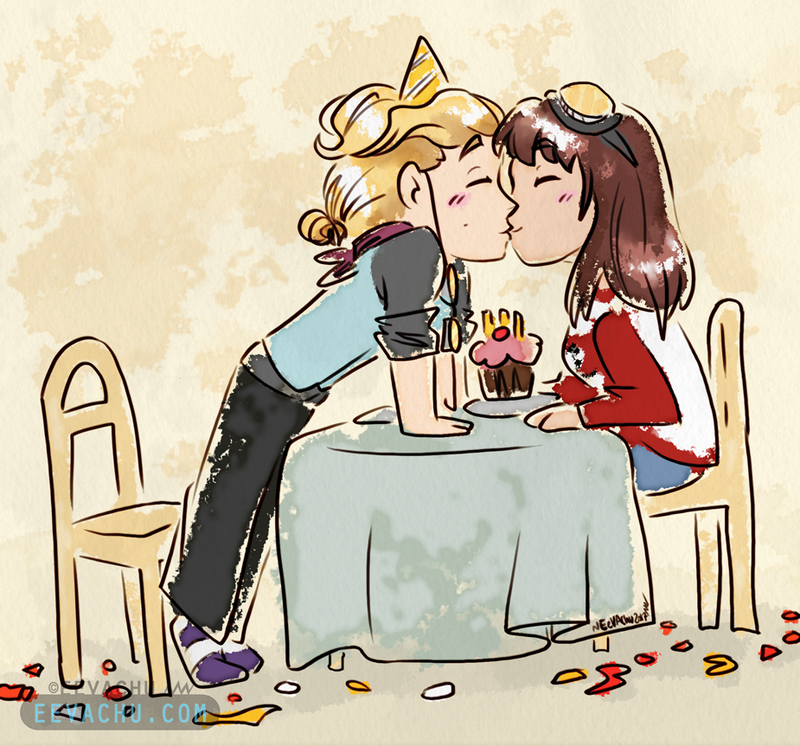 She places a yellow and white striped birthday hat on Holtz’ head. Holtz stares at her, wide-eyed and smiling. Erin holds up a finger, indicating Holtz should wait. It’s as Erin produces a remote from her pocket that Holtz notices Erin is wearing a pair of her goggles. Erin presses a button on the remote and there’s two medium poofs from above them. Holtz looks up to see confetti falling from the ceiling. She squeals in delight between Erin and the falling confetti. 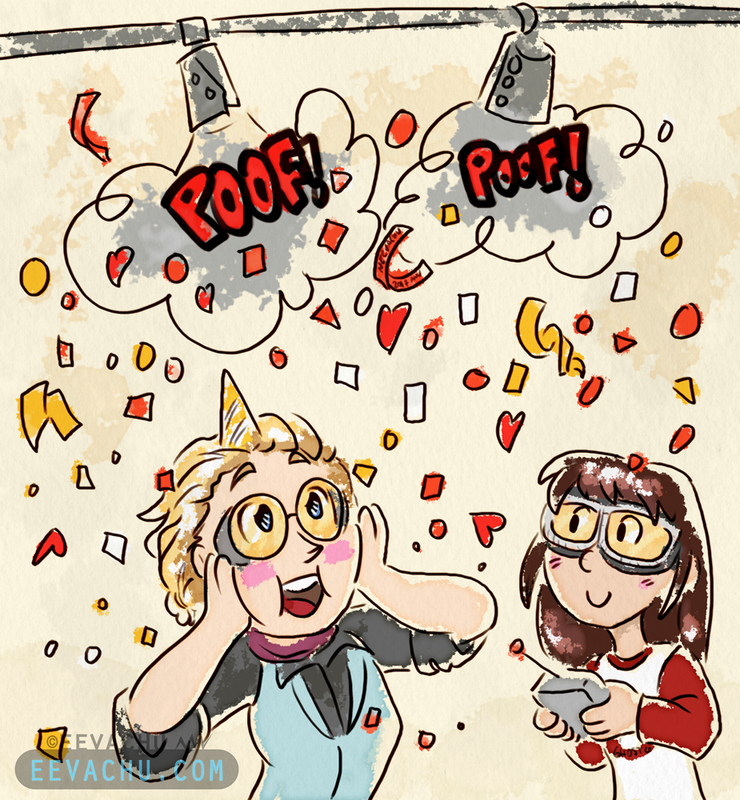 “How did you do all this?” Holtz asks as she bats at the falling confetti. She catches a heart shaped one and holds it in her palm. Erin pulls off her goggles and sits down at her desk, which now has a tablecloth on it. “I used your ceiling slime rig from April Fools, it works pretty well with confetti. I hid everything in plain sight, that banner has just been folded on my desk right where you could see it. I figured you’d find any physical present I got you, based on what Abby’s told me, so I got you an experience. And some poofs. If that’s okay?” Erin explains, Holtz can hear a bit of nervousness in her voice. “And now that it’s midnight,” Erin trails off as she reaches under the cloth covering her desk, producing a giant cupcake with candles, and one of Holtz’ torches. She flicks the torch on and lights the candles. “Make a wish,” Erin says as she holds the cupcake up to Holtz. Without hesitation, Holtz leans in and blows out the candles. “Oh my god! I love you,” Holtz says before she can stop herself. “I love you too,” Erin says back. Then Holtz is leaning across the table and kissing Erin and it’s perfect. Holtz laughs as she pulls away. “What?” Erin quirks an eyebrow, a goofy grin on her face.